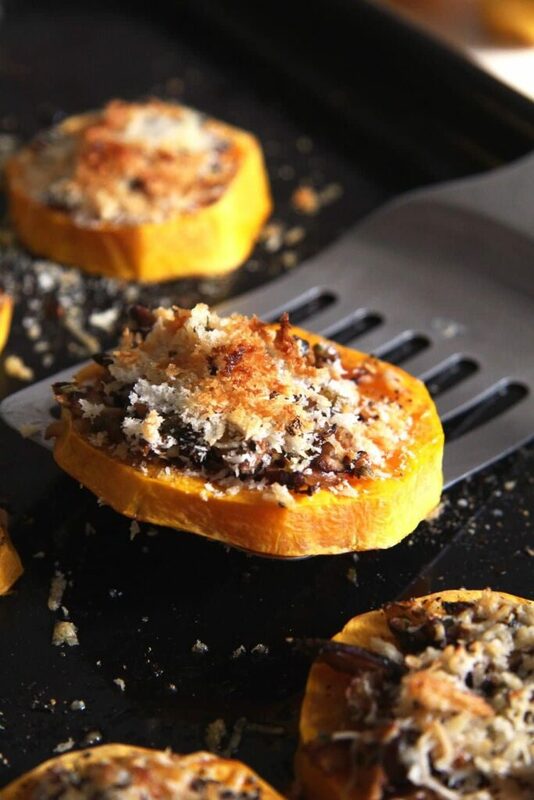 Loaded butternut squash slices baked with Parmesan, shiitake mushrooms and panko breadcrumbs. These butternut slices are a new discovery for me when talking about pumpkin recipes. I’ve made this for the first time not very long ago and I liked it so much, I kept making it with different toppings. Up until now this is my favorite combination, but please, don’t confine yourself to trying only this version, keep adding things to the topping or replace some of the ingredients to fit your taste. 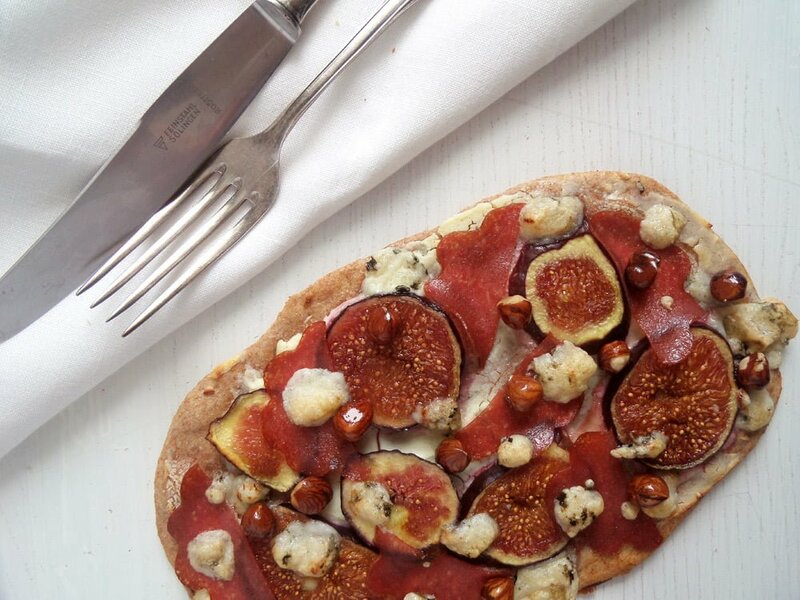 We had these pretty slices hot for lunch alongside a nice crispy salad, but not only. 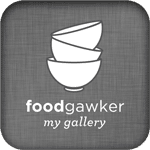 I definitely enjoy eating them cold, either on a slice of rye bread or crisp bread smeared with cream cheese or hot pepper paste or nicely squashed inside a tortilla, drizzled with some sour cream and topped with raw red onions. Sooooo good! Actually, that would be my favorite way of eating them! 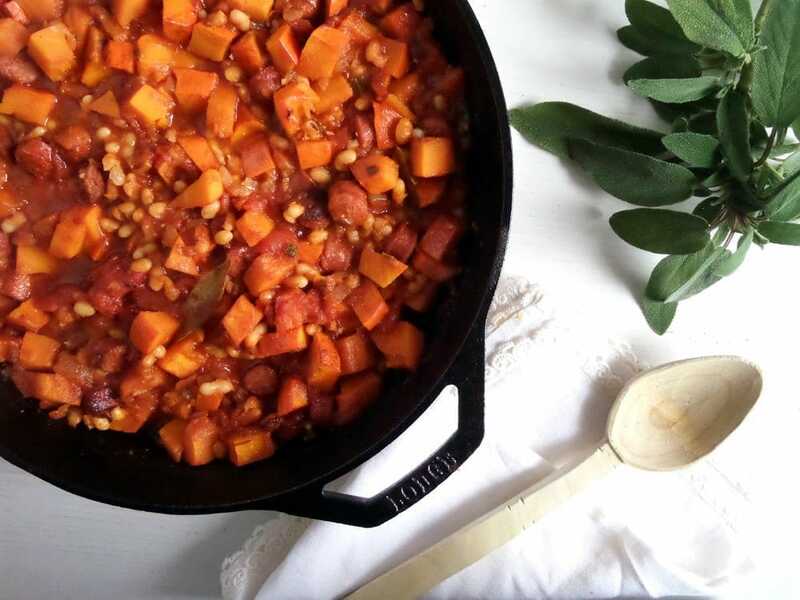 For best results you will need a long butternut squash and you will only use the long seedless part of it, the rest might be used to make a soup, a risotto or a salad. Cut the long part of a butternut squash and remove the peel. Slice the squash into slices about 1,5 cm/ 0.6 inch thick. Place them on a lightly oiled baking tray. Brush them with the olive oil, sprinkle them with salt and pepper and bake for about 20 minutes or until soft. In the meantime clean the mushrooms and chop them finely. Mix them with a few drops of lemon juice. Chop the shallots and the garlic clove very finely as well. Give them to the mushrooms. Heat 2 teaspoons of the butter in a small pan and lightly braise the mushroom-shallot mixture. Remove from the heat and stir in the finely chopped parsley and the lemon zest. Add salt and freshly ground black pepper to taste. Increase the heat of the oven to 225 degrees Celsius/ 440 degrees Fahrenheit. 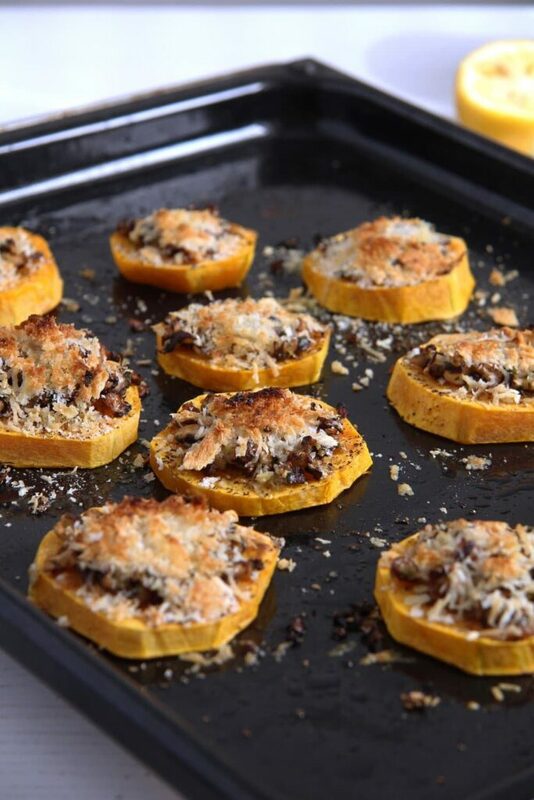 Top the butternut squash slices with the mushroom-shallot mixture. 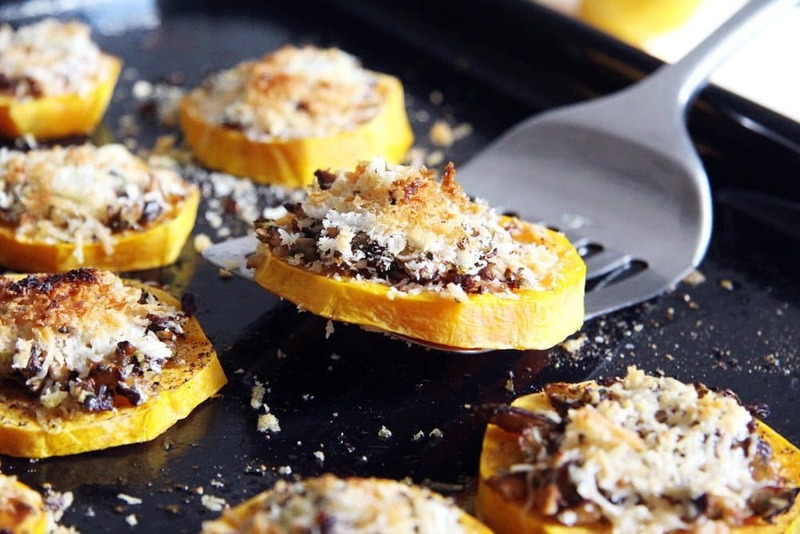 Mix the freshly grated Parmesan with the panko breadcrumbs and divide this mixture on top of the squash slices as well. Top with tiny dots of the remaining teaspoon butter and bake for about 8 minutes or until nicely golden. Serve hot with green salad or cold on bread or in a tortilla, optionally topped with sour cream. I hope you don’t mind me saying, but Parmesan is not vegetarian, it uses animal rennet (calf rennet). A vegetarian alternative would be hard cheese, it’s similar, but not Parmesan. 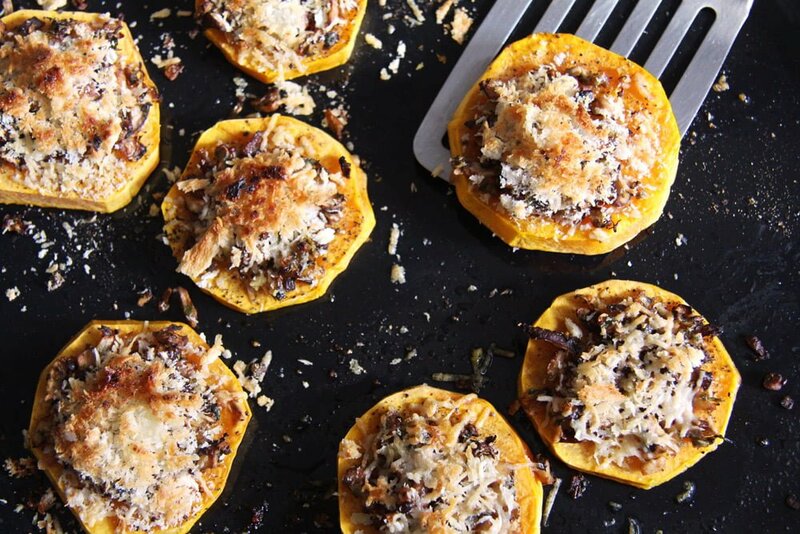 What a delicious and unique way to enjoy butternut squash! What a cool way to enjoy butternut squash! I could see these making for a fun “pizza” night where everyone can choose their toppings and the kids actually want to eat their vegetables 🙂 I’d go for your buttery mushrooms, yum! Shiitake mushrooms just make everything better, don’t they? Lovely way to prepare squash and the peel wasn’t bad as I left it in long enough for the squash to be tender.